“Bromo is closed” the lady told me. 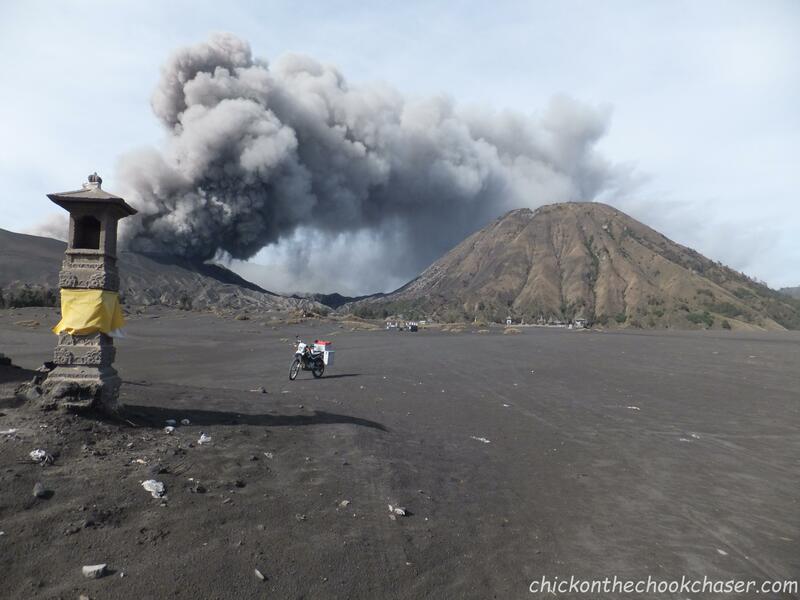 The famous volcano in the east of Java was throwing clouds of ash in the air. Coming from the Netherlands, where hills are rare, mountains don’t exist and volcanos are viewed upon as a completely alien concept, to me this was very exciting news. It wasn’t allowed to climb the volcano since it was active, but you could still go to the nearby village and observe it from there. 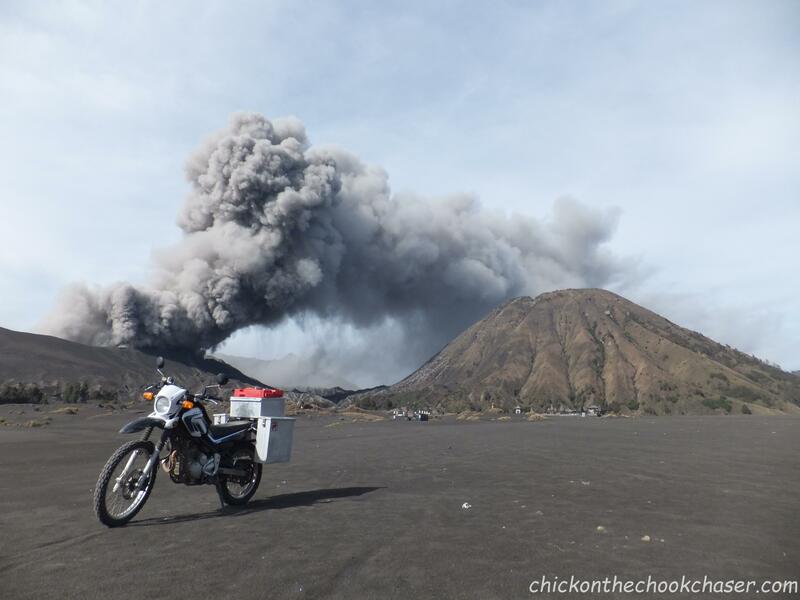 I was convinced, the ride through the mountains would be great and to see an active volcano, I was definitely going! 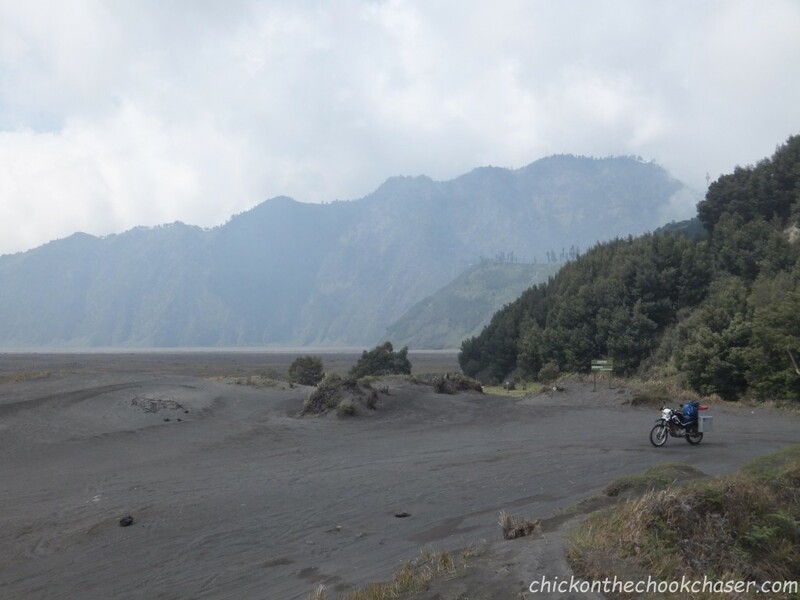 As expected, the ride to Bromo was beautiful. Curvy roads meandering through farmland and nature, spectacular views and beautiful locals riding their horses. Entering the village at the top I was required to pay a $1 entrance fee. The guy in the toll booth told me to go right at the y-intersection to go to the lookout. I entered the village and stopped at the y-intersection. My curious and stubborn nature encouraged me to check out the left-hand side of the road first. At the top was a gate blocking the road, coming to a stop in front of the gate I looked around for a spot to park the Chookchaser. But before I found a suitable spot a local guy came to the gate and opened it for me. Not knowing where the road would take me I curiously made my way past the gate, and downhill. Then the road took a slight right turn and in front of me was a vast, empty, desert-looking sandy flat. 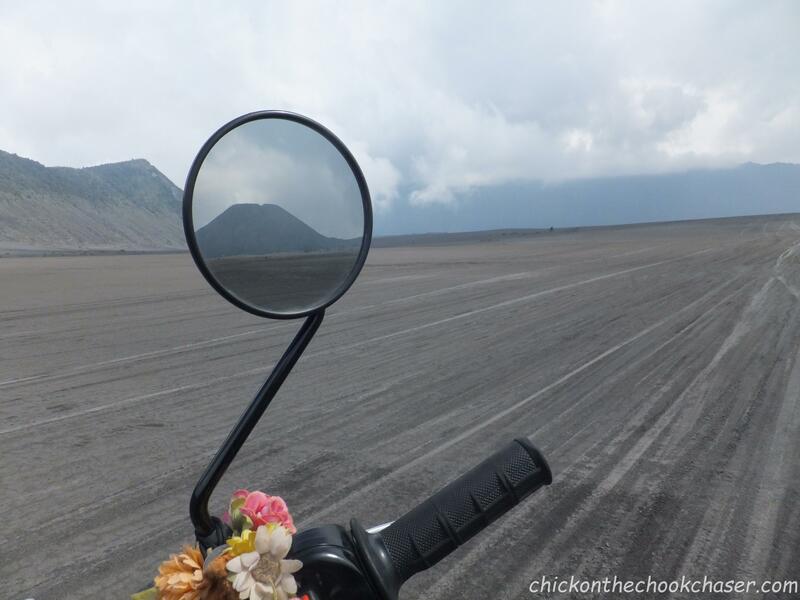 When I looked over to my right it dawned on me I was in the crater of the volcano! What! I was told it was closed! 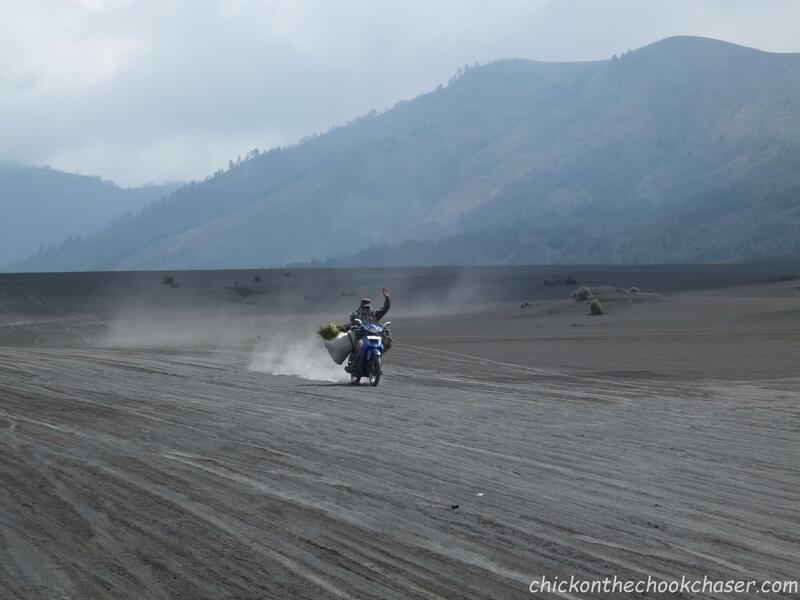 And here I was, sand everywhere, fully loaded motorbike in the crater of a volcano! Some locals passed me by, their scooters fully loaded with farm produce. It seemed like they used the crater to transport their goods from A to B. There were tyre tracks in the sand marking the routes well-travelled. And after closer inspection I noticed there were even road signs pointing people in the directions of nearby villages. Some more scooters with piles of produce on them passed by. While I was still in awe of where I was a father and his two sons stopped next to me. 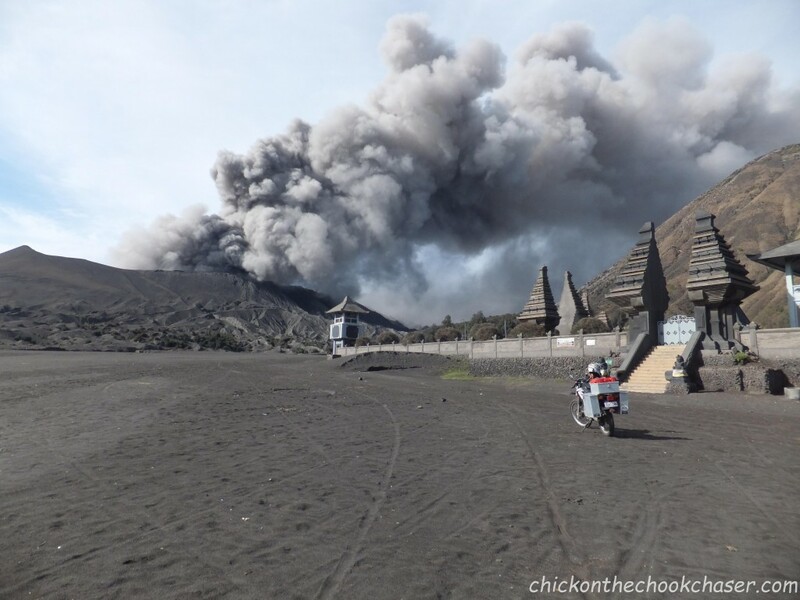 They lived in a city some 60 km away and came to see the volcano now it was active. So apart from these local tourists, there wasn’t a tourist insight. Then my local friends went for a ride and I was alone. Entirely alone, no 4-wheel drives with cameras hanging out of the windows, no guides pointing at various rocky outcrops with hordes of sheepish westerners following them. 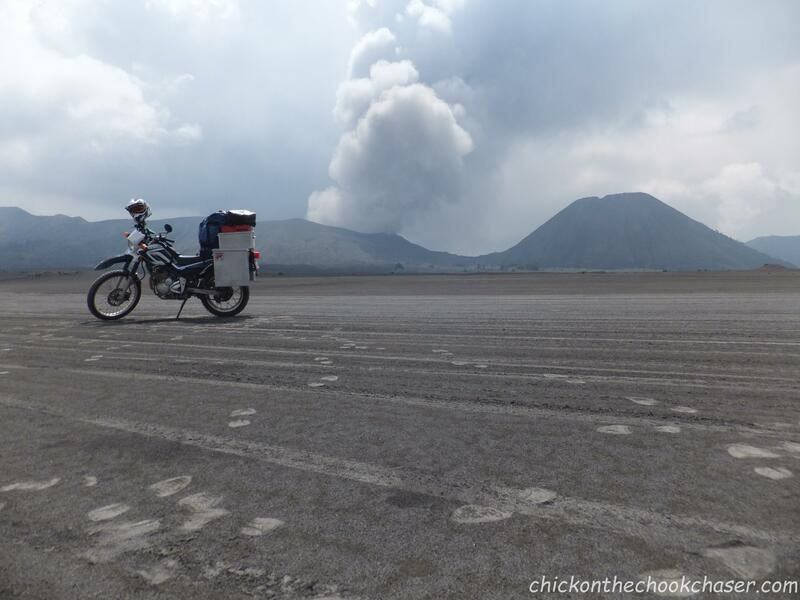 Just me, alone with my motorbike in the crater of a volcano. It hit me, then and there, in this surreal environment, it hit me that I was really on this adventure. That I really was riding my motorbike from Australia to the Netherlands. Visiting places I wouldn’t have imaged, meeting people in circumstances far beyond my comprehension, my world was expending in all possible directions. This is why you do it, the preparations, the paperwork, leaving friends and family, leaving the security of your home, your job, all of it. This beautifully surreal environment made me realise how lucky I am for doing this, how grateful I am for doing this. There are no words to describe the intensity of the feelings I experienced. After all these emotions it was time do some of my best gopro-ing yet. Camera in all sorts of positions, me in all sorts of position. I just couldn’t believe it, here I was in Indonesia, in the crater of a volcano. I pulled out my lunch because I was hungry but also, who can say they had lunch in a volcano? Unfortunately clouds started to fill up the crater. Following the tyre tracks I rushed back to where the road ended and managed to make it out without getting lost in the now thick fog. Once back in the village I managed to find a guesthouse that wasn’t a guest house and paid $9 for 2 rooms, with 3 double beds and 2 couches. To test them all I jumped from one bed to the other before settling on the middle one. Outside rain was now pouring down from the clouds that chased me out of the crater. I settled in on one of the couches with a book. What a great day! The next morning my alarm was set for 4.30. 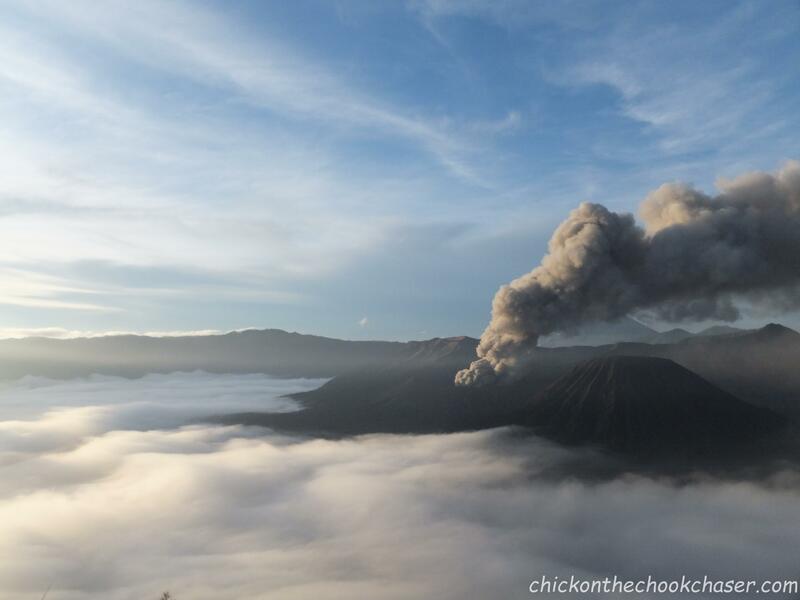 Watching the sunrise over Bromo is a big thing (read: it attracts a lot of selfie taking mass tourism). 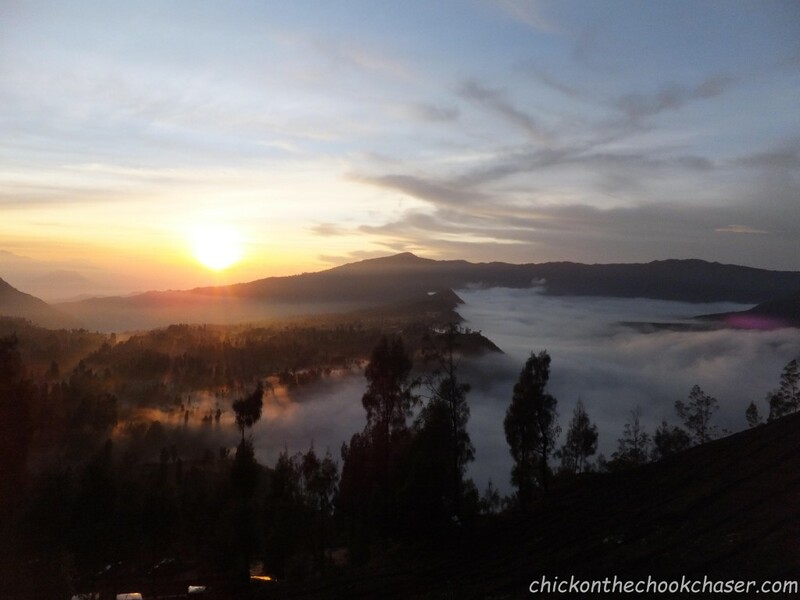 I joined the crowd and was mesmerized by the beauty of the sun appearing from behind the mountains. Ash was still slowly making its way into the sky. Someone told me there was a temple down, somewhere in the vastness of the sand of the crater. Later I followed their instructions and as predicted found a stunning temple, not far from where the ash made its way up. It was still hard to wrap my head around where I was and what I was doing. I made another lap through the crater. 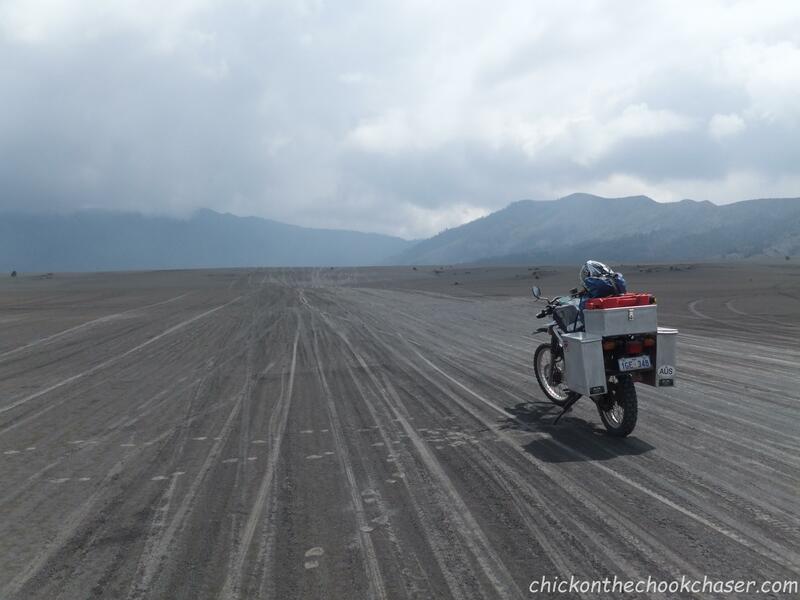 The rain had made it easier to ride in the sand, and the bike wasn’t as heavy since I left much of my belongings at the guesthouse. It was great riding, very enjoyable, endlessly spectacular, impossible to put into words! These are the rewards for overcoming your fears, for ignoring all the well-meant discouragements, for simply doing it! The motorbike is clearly having a great time. Hope you’re enjoying yourself too! Thanks Tim! Great to hear you’re enjoying my crazy adventures. 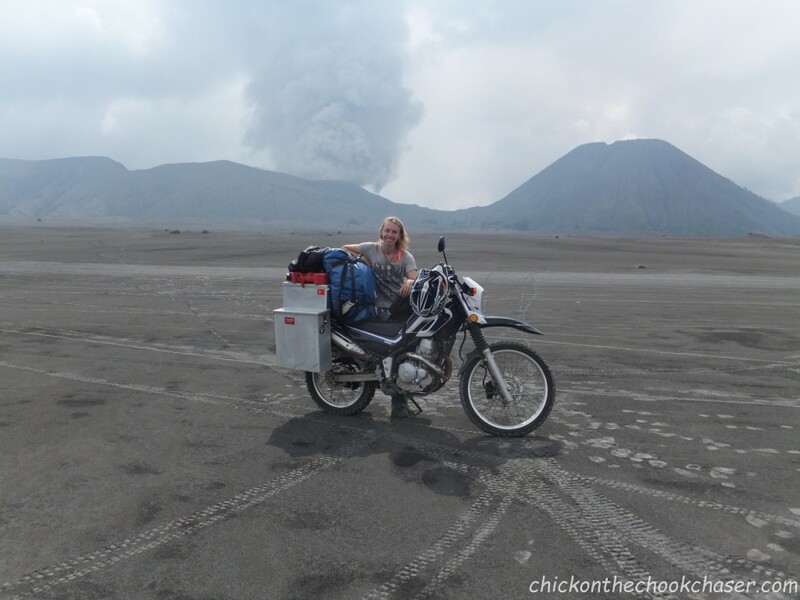 Yeah… I’ve learned there is some crazy disease most motorbike travellers suffer from… All pictures need to have a bike in them! But I can assure you I’m also having a great time Hope you are doing your exploring too! Ben heel benieuwd naar de rest van al je avonturen en verhalen die je gaat beleven. Hou ons alsjeblieft op de hoogte!!! Wat leuk om te horen dat je mijn blog volgt. Hopelijk kan ik zorgen voor wat entertainment en inspiratie. Het Oeral gebrergte over steken klinkts als een geweldig avontuur.Wat houdt je tegen? Als je liever niet alleen wil gaan zijn er tegenwoordig een groot aantal websites om een groep rijders bij elkaar te krijgen. Bijvoorbeeld, horizonsunlimited.com, advrider.com en verschillende facebook pagina’s. Ik hoor het graag als ik iets voor je kan betekenen. Your traveling is inspiring to me. I get quite lonely when on my adventures. Perhaps it is because I am an old guy and no one is particularly interested or impressed with a 250cc adventurer. I am now almost exclusively riding my RX3 Cyclone instead of the heavy BMW R1100GS and love it! I rode it in Baja Mexico last spring. Your recounting the guesthouse experience with the 3 beds reminded me of the fairy tale about Goldilocks…you are the inquisitive Goldilocks! My thanks for chronicling your travel back to the Netherlands, you are doing an excellent job of it and I look forward to reading more. Thanks for your kind words. It is so great to hear that my crazy adventures are inspiring! To me your adventure sounds pretty awesome too! Actually I have great respect for anyone who goes out and does the things they want to do, regardless of age or the type of adventure. Btw, good thing you put the GS on the side,small bikes are way more fun! This is by far one of the better blog posts I have read. 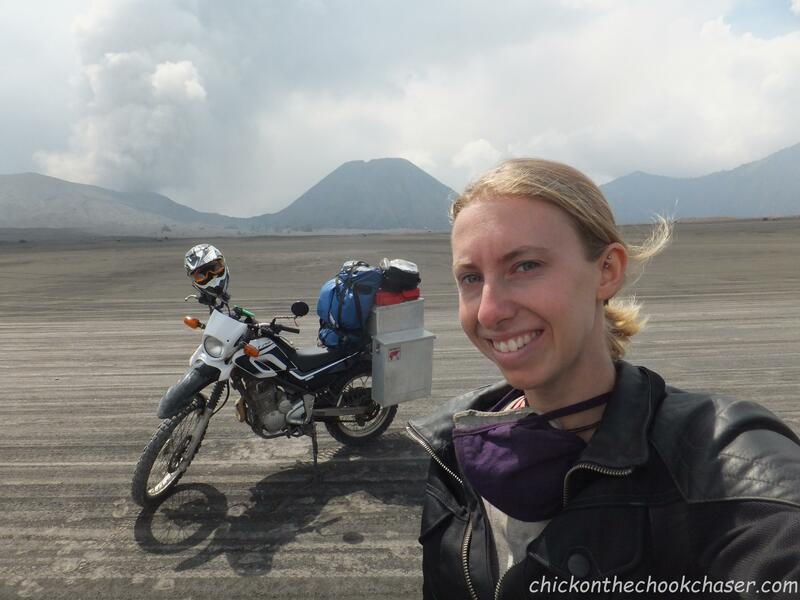 I read many adventure rider blog posts and you have inspired me to the fullest. You are fearless….. thank you for sharing!! To all of you taking the time to reply to my posts, thank you! It is so inspiring to receive your kind words and thoughts. Please keep sending those comments! Thanks so much!